So they are squaring off again today in Berkeley. On one side, masked ‘Antifa’ instigators looking for a fight, and on the other, rabid Trump supporters hoping to get under the skin of anyone with liberal political leanings. The cause of today’s clash, supposedly is the on-again, off-again scheduled appearance of right-wing provocateur Ann Coulter. When U.C. 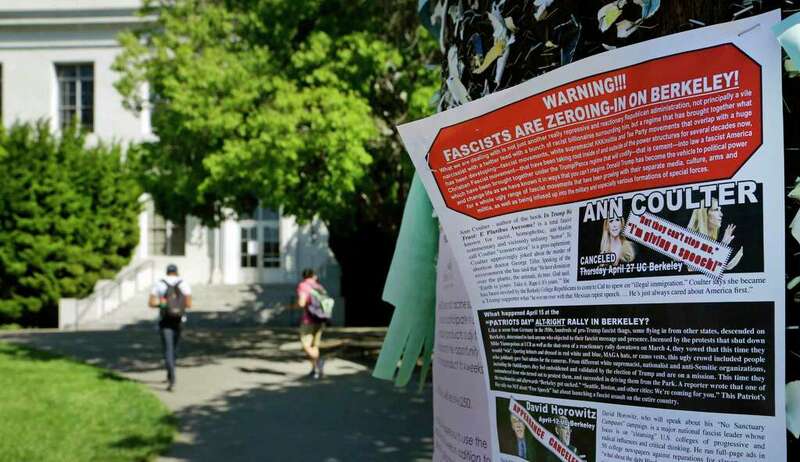 Berkeley canceled Coulter’s speech out of safety concerns, an army of pundits on both sides of the political spectrum lampooned the public school for tainting its longstanding credentials as the birthplace of the Free Speech Movement. Most notably, The Onion skewered the school with a piece that claimed the university was on lockdown because stray pages of the Wall Street Journal had been found on a park bench. Funny! And The New York Times has harped on this same theme in several recent articles, albeit in more sophisticated fashion than the Onion, including another story on the topic in today’s edition. And here’s another outlet, CNN, taking its shot at Berkeley. But this framing of the controversy over Coulter’s Berkeley appearance misses the point. This is not a story about the fragile nature of free speech at a place long known for being a bastion of it. It’s about clamorous extremists on both sides preventing any kind of productive political dialogue from happening. They don’t want to talk. They just want to yell, shove, and throw bricks. Berkeley chancellor Nicholas Dirks, in justifying the school’s concerns about Coulter’s appearance, said, “This is a university, not a battlefield.” In essence, he is saying enough is enough. Right wing media outlets such as Fox News have had a field day characterizing the majority of American college students as “snowflakes” who need to be sheltered in cushioned safe spaces, protected from viewpoints they might find objectionable or hurtful. Fair enough. You only have to look at the much-publicized near-riot at Middlebury College during an appearance there by American Enterprise Institute scholar Charles Murray to see that there’s some truth to this view. But Berkeley’s concerns for safety are very real. The campus and surrounding community has already endured violent protests in recent weeks, notably during an appearance by right-wing irritant Milo Yiannopoulos on February 1. Two other violent protests followed on March 4 and April 15. Yiannopolous and Coulter delight in getting under the skin of anyone with political beliefs that don’t jive with their extremist views. They are intent on stirring up trouble for the sake of stirring up trouble. They are not standing up for free speech, and neither are the people standing up for their right to speak. This is an abuse of free speech only to provoke others. What a waste. Public figures such as Coulter and Yiannopolous have huge followings, and could do so much more with their platform to further much-needed constructive dialog in this country. So let’s stop framing the controversy over Coulter’s scheduled Berkeley appearance as a battle over free speech. It’s not. That’s counter productive. We need to tune out the extremists on both sides so that the overwhelming majority of more reasonable people in this country can get together and talk. And as long as the focus is on the shouting and punching hordes, that won’t happen. These Kansas high school journalism students brought down their new principal with some solid reporting. A new principal at a high school in Kansas had made it through the vetting of school administrators without them uncovering the dubious nature of her resume, which included a degree from a notorious “diploma mill,” Corllins University. She was hired by Pittsburg High School and began work in March. But not so fast. When a group of student journalists at the school began looking into their new principal’s background, they discovered the questionable nature of her education and work history. The spend days reporting their story, even conducting a rugged interview session with the new principal via Skype. Then they published their story. Days later, the new principal, Amy Robertson, resigned. On her way out, she resorted to a common tactic of wrongdoers today when their misdeeds are uncovered by investigating journalists. She said the students’ story was “not based on facts.” Really? So why not fight, instead of resigning? My favorite part of the Washington Post story recounting the heroics of these high school scribes is that the students continued to work on the story over their spring break. They knew they were on to something special, and they wanted to get it right.